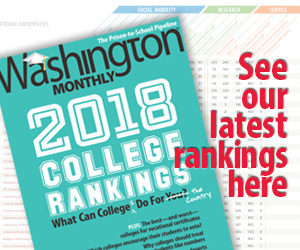 For the last thirteen years, the Washington Monthly has ranked colleges based on what they do for the country. No publication has ever ranked the schools where millions of Americans seek job skills. Until now. For universities squeezed by falling enrollments, recruiting ex-offenders could be a new source of revenue—and a chance to transform lives. A few universities are using predictive analytics to boost student success. Are they outliers—or the wave of the future? The battle lines for the next Congress are already clear. Nearly a third of all undergrads are twenty-five or older. Yet no publication ranks the top schools for them—except us. Our first-of-its-kind list of the schools doing the most to turn students into citizens. Why the war on minority voting rights is about to get even worse. Do You Know Why You Pulled Me Over? Investigatory traffic stops are pointless and discriminatory. Why do police still conduct them? A colossal infrastructure investment program could make Beijing a lot of friends around the world—or a lot of enemies. How hidden fees bleed the middle class dry.